On October 17, 2017, FEMA released a long awaited “refresh” of the National Incident Management System (NIMS). This update to NIMS attempts to incorporate lessons learned and best practices from a wide variety of disciplines, at all levels of government, from the private sector, tribes, and non-governmental organizations. It also recognizes the evolution of our nation’s risk environment since 2008 as well as the maturation of our national incident management capabilities over that time. The goal of this analysis is to identify notable changes in the new NIMS document compared to past iterations, suggest how specific changes might impact stakeholders, including EMSI clients, and provide general description and explanation on both large and small items of interest in this document. The changes to NIMS, including the Incident Command System (ICS), are generally minor and should not require significant change to existing NIMS implementation, training, and application programs. That said, there are a number of updates in the new NIMS that are worth noting. In the cover letter from Acting Department of Homeland Security Secretary, it states that the FEMA Administrator, in his role as the head of the National Integration Center, is charged with managing and maintaining NIMS and will issue revised NIMS guidance and support its implementation. Aside from these changes, the structure of the document remains unchanged. Resource Management describes standard mechanisms to systematically manage resources, including personnel, equipment, supplies, teams, and facilities, both before and during incidents in order to allow organizations to more effectively share resources when needed. • Reorganizes key resource management activities to address resource planning (pre-incident), resource management activities (during incidents), and mutual aid. • Establishes a foundation for a national qualifications system by clarifying processes for qualifying, certifying, and credentialing incident personnel. • Emphasizes the role of the Authority Having Jurisdiction (AHJ). Pre-incident resource management is addressed in Resource Management Preparedness, explicitly explaining qualifying, certifying, and credentialing as a decentralized process that relies on this to the AHJ. It further explains that an AHJ may be a public or private sector entity, including a private sector company or NGO, that has legal authority to establish and administer a process qualify, certify, and credential person. This authority may be derived from the elected official, or in the private sector, from the senior executive. This is a development that formally recognizes the qualifying, certifying, and credentialing processes of a private sector entity, as long as they follow the nationally standardized criteria and minimum qualifications, opening the door for private companies to establish formal and recognized ICS qualification programs. 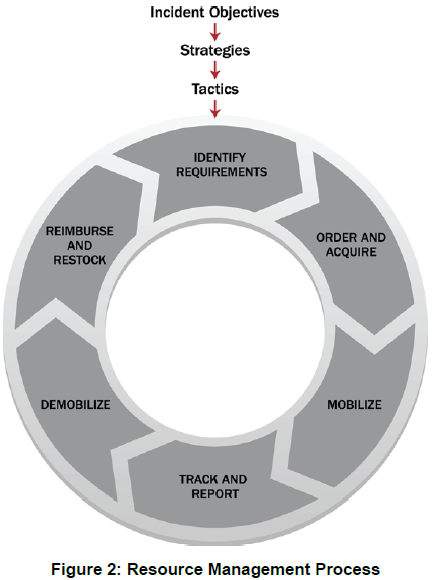 NIMS 2017 includes a cyclical resource management diagram highlighting a resource management process specific to resource management activities during an incident. This replaces the cyclical resource management process from NIMS 2008 that included resource management preparedness activities (most notably the inventory step). Inventory is now included in Resource Management Preparedness section instead of During an Incident. Mutual Aid, previously a part of the Preparedness component in NIMS 2008, is now a part of the Resources Management component. In NIMS 2008, MACS was described as “a system, not simply a facility” and included “a combination of facilities, equipment, personnel, and procedures integrated into a common system with responsibility for coordination of resources and support to emergency operations”. A diagram in NIMS 2008 depicted the Incident Command Post as an element of MACs, described as “On-Scene Multiagency Coordination” compared with “Off-Scene EOCs and/or MAC Groups”. EOCs and MAC Groups were previously a part of MACS. The new use of MACS broadens the definition of MACS to include the Command and Coordination architecture for tactical coordination (ICS), operations support coordination (EOCs), policy level coordination (MAC Group), and their support through coordinated information (JIS). The ICS section of NIMS 2008 described fourteen ICS Management Characteristics. These characteristics remain unchanged, but now apply more broadly, not simply to ICS, but to all NIMS Command and Coordination elements. This is the element of NIMS that people are most familiar with and more apprehensive about changes. Fortunately, ICS remains largely unchanged and will continue to function as the same incident management system responders have used for four decades. But it does include a few minor changes of which practitioners should be aware. Intelligence/Investigations Function: Typically, staff in the Planning Section are responsible for gathering and analyzing operational information and sharing situational awareness, while staff in the Operations Section are responsible for executing tactical activities. This common and familiar construct may still be used for intelligence and investigation activities. 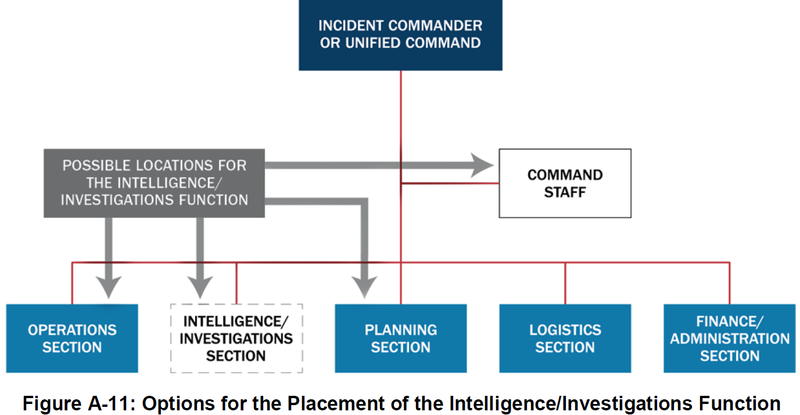 In addition to being organizationally located in the Operations Section and/or Planning Section, the Intelligence/Investigation (I/I) function may also be established as a Command Staff position or a stand-alone General Staff function (Intelligence/Investigation Section), or some combination thereof. 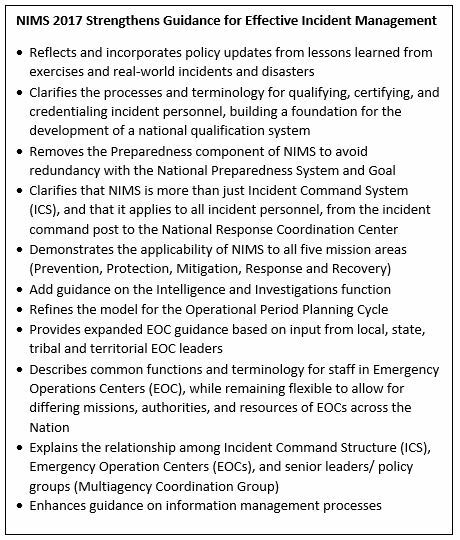 This essentially codifies in NIMS doctrine what skilled and experienced incident management practitioners have known for a long time: ICS is flexible and I/I can be incorporated however necessary. Revised “Manageable Span of Control” Guidance: The Span-of-Control guidance is loosened to provide more flexibility. “The optimal span of control for incident management is one supervisor to five subordinates; however, effective incident management frequently necessitates ratios significantly different from this. The 1:5 ratio is a guideline, and incident personnel use their best judgment to determine the actual distribution of subordinates to supervisors for a given incident”. This leave Span-of-Control flexible and up to common sense. Additional Command Staff Positions and Command Advisors: Additional Command Staff positions may be necessary and NIMS 2017 allows for this flexibility. In conjunction with establishing Command Staff Officers beyond Public Information, Liaison, and Safety, Incident Commanders or a Unified Command may establish supplementary Command Staff Officers, in addition to Command Advisors and Technical Specialists. Again, this is a concept that skilled and experienced incident management practitioners have implemented for a long time, but now it is included in the NIMS doctrine. As a reminder, “Officer” is a specific term for those who are directly delegated areas of responsibility that specifically reside with the Command function; Command delegates the accomplishment of these tasks, once clear direction is provided, to the Officer level. If the function does not represent an inherent function of Command, “Advisor” or “Technical Specialist” may be a more appropriate organizational position title. Operational Planning Process and Planning P: The Planning P that many of us are familiar with underwent some minor changes but it does not change the output of the operational planning process. In the “Stem of the P”, FEMA added an optional Agency Administrator Briefing. Agency Administrator Briefings have been a part of ICS since inception, but have traditionally not been included in the Planning P because, while the Agency Administrator Briefing is important, it was not a critical step in the development of the IAP, and the Planning P is intended to guide the IAP planning process. Another addition is the option for a Strategy Meeting in place of a Command and General Staff Meeting. This is reflected on the Planning P with “Strategy Meeting / Command and General Staff Meeting” replacing the old “Command and General Staff Meeting” box. For people who have been conducting Command and General Staff Meetings, this results in no change to their planning process. 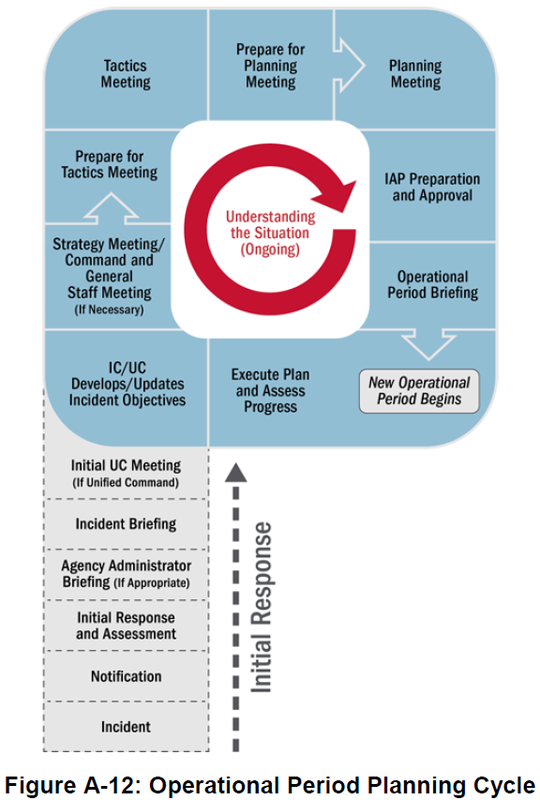 Finally, a graphic was added to the middle of the Planning P to illustrate that the situational awareness process in ongoing throughout the planning process. Resource Team vs. Strike Team: Strike Teams may now be referred to as “Resource Teams” when referencing to law enforcement resources. This is simply a terminology change with no impact to the functioning of the system. Expanding the Planning Section: While NIMS 2017 discusses the need for additional technical expertise to augment the Planning Section (such as Technical Specialists), it does not make specific mention of establishing additional units, like an Environmental Unit, to the traditional four ICS Planning Section units (Resources, Situation, Documentation, and Demobilization). But NIMS 2017 does not specifically say additional functional units cannot be established in the Planning Section. With a nod to the inherent flexibility of the system, the establishment of additional functional units in the Planning Section is still acceptable, as long as it doesn’t replicate existing functions already present in ICS. Otherwise, there are no major changes to ICS and the system continues to function as it has for four decades, requiring no change to existing NIMS 2008 compliant ICS training and application programs. • For a nongovernmental entity, like a private company or NGO. • ICS or ICS-Like Structure: This is an EOC organized using the ICS organizational structure or an ICS-Like organizational structure that modifies certain position titles and terminology to distinguish the EOC from the ICS functions in the field. • Incident Support Model Structure: This is an EOC organized using the most common functions of the EOC. For example, an EOC that focuses on information, planning, resources support, and situational awareness may simply organize around those functions. • Departmental Structure: This is an EOC that organizes around existing departmental, agency, or business functions. This is a common organizational structure among private sector companies that organize around existing business units. Multiagency Coordination Groups were a part of NIMS 2008 but were a sub-component of MACS. It is a more prominent element of NIMS 2017, where it is clearly described as a policy entity that does not perform incident command functions. Instead, as part of the off-site incident management structure of NIMS, MAC Groups act as policy-level bodies during incidents, supporting resource prioritization and allocation and enabling decision making among key personnel. The Joint Information System (JIS) was a critical element of NIMS 2008, but it was included in the Public Information section of Command and Management. JIS now makes up the fourth NIMS Command and Coordination structure. Nothing significant about how the JIS functions has changed. The JIS operates and supports the other NIMS Command and Coordination structures. NIMS 2008 included three key Communications and Information Management principles, including Interoperability; Reliability, Scalability, and Portability; and Resilience and Redundancy. It now includes a fourth principle of Security, acknowledging the potential need for confidentiality in communications and information management. The Communications and Information Management component now also promotes the U.S. National Grid as an alternative to latitude/longitude map references. For EMSI clients and NIMS stakeholders, these changes do not amount to a significant shift in NIMS and ICS training, implementation, and application. These minor changes will be incorporated into EMSI NIMS and ICS programs, including training courses. EMSI incident management experts are available to address specific concerns from the incident management community.